How many times do you need to snooze your alarm clock before you actually climb out of bed in the morning? Enough to be late for work every day, right? So while there are lots of crazy alarm clock designs out there that make it harder to snooze, the Chipper—which uses a sensor strip to only silence your smartphone’s alarm once you’re physically out of bed—might be the most effective. Developed by a group of college students from Cal Poly in San Luis Obispo in California, the Chipper relies on a long thin sensor strip that sits underneath a mattress. 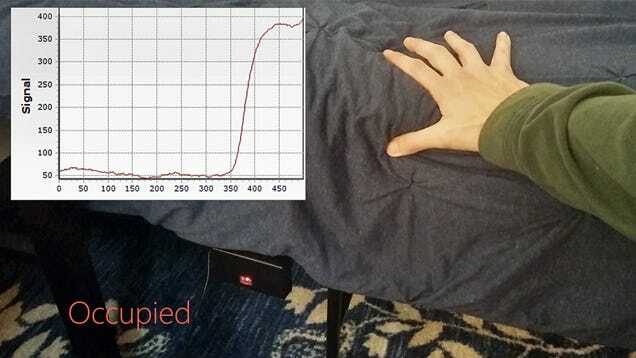 It works not unlike the touchscreen on your smartphone to easily detect when someone is lying on top of the mattress, and when they’ve climbed off it. The Chipper hardware connects to your smartphone and an accompanying app at the end of the night so that when morning rolls around and the alarm you’ve set goes off, the only way to silence it is to physically crawl out of bed. If you then decide to lay back down once it’s stopped, the under-mattress sensor won’t be fooled and will trigger the alarm once again. The only way to fool the Chipper is to lift your mattress and remove that sensor strip, but you might as well just put all that effort towards showering and getting your AM coffee fix.